Earlier in the month I attended Maine's Reading Round-Up of Children's Literature in Augusta. This is an annual state conference that brings together youth services librarians and school librarians. Each year the Lupine Award is presented at Reading Round-Up. "The Lupine Award is designed to honor a living author or illustrator who is a resident of Maine, or who has created a work whose focus is Maine, as shown through the work’s characterization, plot or setting." This year a nonfiction book, Giant Squid by Mary Cerullo and Clyde Roper, won a Lupine honor in the juvenile/young adult category. Read Louise's review of Giant Squid. I was pleased when I learned that the winner of the 2012 Lupine Award in the picture book category was also a nonfiction book, and I had the privilege of seeing Matt Tavares accept the Lupine Award at Reading Round-Up. 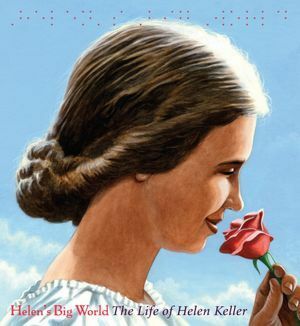 The picture book biography chronicles Helen Keller's life from infancy to adulthood. Rappaport eloquently weaves quotes from Helen's own writing into the narrative. The book is well designed. Quotes are set apart in large fonts in different colors. Brilliant watercolor, pencil and gouache illustrations encompass most of the two-page spread. Illustrations show Keller feeling water run from a pump into her hand, touching a horse, and feeling sea spray on her face as she and Annie Sullivan ride in a sailboat. Tavares explains in the illustrator's note that he focused on Keller's other senses (touch, hearing and taste) to illustrate her story. 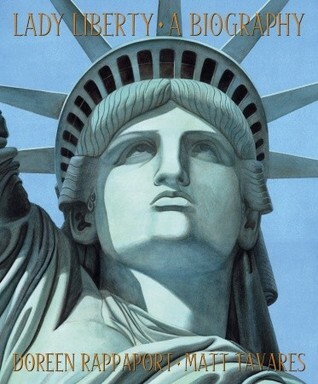 Helen's Big World is a book that deserves a place in a juvenile biography section. Visit Doreen Rappaport's web site to learn more and to view illustrations from the book. Please note that the most recent Lupine Award list is 2012-2007. 2013 Lupine Awards will be announced at the 25th Annual Reading Round-Up on Thurday, April 10, 2014. 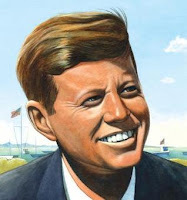 Maine has great nonfiction writers and illustrators for the younger generation and it is nice to see them get recognition here at the Nonfiction Detectives. Thanks for catching the date error, Laurel! I made the corrections. Thanks for all of the hard work you do with the Lupine Committee. I can't wait to see which books win next year.